Welcome back. You got through snails; how do you feel about bugs? I was alerted to a couple of insect behavioral studies that I thought you might find intriguing, but if you’re going to be bothered, I could…oh, let’s try. Maybe you’ll grow up to be entomologists--scientists who focus on insects. The closest I ever came to entomology, besides taking an unrelated course in the Entomology Department’s building, was reading some juicy background for a series of insect poems. As befits an undergraduate creative writing course, my insect poems were about mating, altruism and cannibalism. The studies I wanted to tell you about don’t get into mating, but 2 out of 3 isn’t bad. A CNN report reviewed computer vision studies of locust swarming (see my P.S.). Whether you learned about locust in the Bible or elsewhere, I’m sure you’re aware that these species of grasshoppers swarm and ravage crops and vegetation during their mass migrations. The research being conducted at Princeton University’s Couzin Laboratory is aimed, for example, at predictive modeling of where swarms may occur. 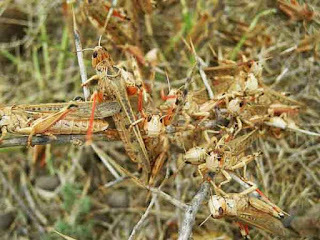 What really caught my eye was the researcher’s pronouncement that the locusts were not participating in the swarm to be cooperative and support the team. They were flying along to avoid being bitten or eaten by the other locust. 25 May 2008, Copyright UN-FAO. It’s like kids, lining up and poking or pushing each other. Instead of poking or pushing, the locust swarms are cannibalistic hordes. I was surprised to learn this was detailed in 2008, if not before, in a paper, “Collective Motion and Cannibalism in Locust Migratory Bands,” published in Current Biology. Was it because this was a finding about insects that this wasn’t publicized or was it just another one of those cool scientific findings that I somehow missed? In stark contrast to the selfish, aggressive behavior of locust--at least when they’re out with the gang--a report in Science painted a bright picture of a certain tropical termite species. These guys, well, the older workers, are true role models. They’re ready to give it all for the team. The worker termites of this species, Neocapritermes taracua, have salivary gland secretions in their abdomens. As they age, they also develop crystals of a copper-containing protein in two backpacks. Mix the crystals with the secretions and… voila!...you’ve got a toxic gunk that can paralyze or kill termites of another species. And that’s what the old guys do. If grabbed by a predator or another termite, they commit suicide; they explode, releasing the sticky toxic substance. What’s exceptional here is the two-component suicide kit, particularly with one of the components stored externally. Although I’m unimpressed with their public relations teams, I offer three cheers for the entomologists! Thank you for the fascinating work. And thanks for stopping by. I’ll see if I can find my old poems in case you’re interested in insect mating behavior. "Mating, altruism and cannibalism" ...sounds like the good old days in Fiji. 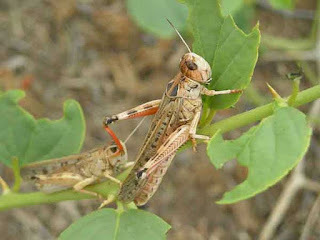 And then there's the story of the Grasshopper and the Ant, updated to today's mores.